I'm in that interesting spot writers sometimes find themselves in...in between contracts. I turned in my last contracted book January 15th, and spent a week revising one proposal as requested and then creating a new series proposal at another editor's request. Now I'm...waiting. Ugh. I. Hate. That. Let me say that again. I. Hate. Waiting. I'm a type A personality. It didn't take my agent long to label me slightly obsessive. Psalm 37:3-6 Trust in the Lord and do good; dwell in the land and enjoy safe pasture. Delight yourself in the Lord and he will give you the desires of your heart. Commit your way to the Lord; trust in him and he will do this: He will make your righteousness shine like the dawn, the justice of your cause like the noonday sun. Hmmm. Could David tell us to trust and commit our ways to Him anymore often in that passage? I say I trust God, and I really do try. But I'll be honest...times like this when everything is outside of my control are hard. There is truly nothing I can do but sit back and trust Him to have my future and my best interests in His hands. He knows which books I should write, in which order, and for which houses. Now I have to trust. I also am tired. Frankly, I needed a few weeks to read, work on new ideas, dream a bit, and not write with a deadline marching across the calendar. The Type A makes it very easy for me to tackle everything. I'm good at it. I can do alot. But I also need to give myself a break, let me body and mind rest. And maybe God knew I wouldn't do that without an imposed break. Yep, I think He knows me well. You see, I'm still very new to this field. I'm used to being in fields (law, non-profit world, teaching) where, while I couldn't control everything, there were certain things I could always do to help direct results. Do A and B is likely to occur, if not guaranteed. Writing is nothing like that. Instead, it's a real journey of faith. There are still things I can do. Read great fiction. Research areas that interest me. I've got World War Two ideas and horse racing ideas filling my mind because I've been reading non-fiction in those areas. I can draft proposals. But at a certain point, all I can do is wait. You see, I have this assurance deep inside that good things are coming. I just don't know when. And that uncertainty is hard to handle. I also don't know which of the three proposals currently out there will resonate with an editor. Making it EXTREMELY hard to know where to direct my time and energy. So I gave myself another week "off" -- my husband would laugh as I race through books, write reviews, work on ACFW's 2008 conference, etc. But next week, I'll pick up another legal thriller proposal that several editors are interested in. I'll invest a week in it, try to polish it up for my agent to review. And then I'll wait. Rest in Him. And trust that He has my future under control. Sorry I was MIA last week . . . which happens to be the title of my March release. Watch was MIA: MISSING IN ATLANTA in your favorite bookstores on March 11th. That's book #3 for me. I completed book four today. You probably heard me scream with joy when I delivered it to the UPS lady. It's on the way to New York. Hallelujah! COUNTDOWN TO DEATH will be out in October and launches my new Magnolia Medical series. Okay, now back to Donald Maass. When I was reading this lesson on inner conflict, I had to keep remembering that he's helping us move our work into a higher level. His focus is on the breakout novel, which has to wow! the editors and stand out from the crowd big time! But his strategies also help when we're writing category romance or Love Inspired Suspense, and this section gave me a lot of food for thought. Boiling it all down, Maass says to create characters that have two opposing desires, which are mutually exclusive. So . . . the heroine wants to have a home and family and security, yet she also wants to be a free spirit who backpacks through Europe, living on $25 a day with no ties, no constraints, no responsibility. And maybe that example isn't the best, but you get the idea. If our characters have that inner tension because they can't have both opposing desires, they become compelling folks readers will remember. Ah, Mr. Maass, you're going to make us work hard this next week to create heroes and heroines that are multi-faceted and unforgettable. One thing I learned on book four, the more "stuff" the character has to deal with, the more fun to write and hopefully the more interesting to read. So Maass is giving us a way to ensure we have enough fuel to light a fire under our characters and move them forward as they tackle the challenges we present to them. Hey, being a writer is a great life . . . especially when the current work in progress is finished. Have a productive week! Let's all focus on our inner conflict. So my books to judge for the RITA-- RWA's prestigious award for excellence in writing--showed up today. Four books of various subgenre's of romance. As soon as I opened the box, I flipped through the books, read the back cover copy and read the opening paragraph. All the things I do when I'm at the book store looking for something to read. Then I stacked them in the order to which they appealed from my 'shopper' perusal. Over the next few weeks I'll read them during my down time (not writing time). When I'm done with each book, I'll assign it a numeric score from 9 being best to 1 being worst. This part of judging is always very unsettling for me. I feel a great deal of responsibility to judge fairly but judging is subjective. What draws me into a story may not be what draws another reader. So I'll do my best and give as fair a score as possible and hope that I've done my job well. Ah, January, what a 'nice' month. I had a book due January 2. So, December 31, of course, was a harried day for me. UPS closed early; I arrived late. FedEx was open (not even a line!) and off my manuscript went. Ah, January, what a 'nice' month. January has been very healing because I do not have a new contract. I've done a few things that I haven't had time to do in about two years. I started cleaning my office (see post from two weeks ago - and starting to clean are operative words). I've been reading (getting seven books to judge for the RITA really inspires me there - I got a real hodgepodge: short, long, series, mainstream. Very interesting). I've actually watched two movies all the way through (Okay, the two-year-old is more distracting in that department than the book deadlines). Ah, January, what a 'nice' month to worry. Not having a contract, to me, is like forgetting to wear my watch. Did you know that most people today do not wear watches? They rely on their cellphones. I'm not addicted to my cellphone. To me, it's much easier to glance at my wrist than to go look for my purse (I do have a friend who somehow carries her cellphone inside or at least attached to her bra - wouldn't work for me) and dig for the cellphone. I've worn a watch for [insert ridiculously low number here. No! You don't get to insert three numbers - I'll hunt you down] years. If I leave the house without my watch, I will turn around and go back for it. Otherwise, I'm looking at the hair on my wrist every few minutes and getting annoyed. January has given me free time and much time to worry. What to write next? Were the first seventeen book sales a fluke? Will the new editor like my writing? Where am I in my career? Does Nora ever worry? Etc and so forth. Well, this morning I emailed my agent a three-book proposal. I've never done a series before. I've always proposed either one book at a time, or I've proposed two books that were not related. Sunday's Craftie Lady did offer some advice (Thanks Roxanne!). And, since the proposal went to my agent instead of the editor, I'm sure I'll get even more advice. Here's what I sent: Bio, past and ongoing marketing strategies, blurb, one-liner, synopsis, three chapters for book one, synopsis for book two, and synopsis for book three. I'd be interested to know what everybody else does? The Sunday Craft lady continues....with intensity! The old saying is so true: you should write what you love to read, and if you are following this blog, you probably enjoy romantic suspense with a Christian world view. So...how many of you are writing suspense or mystery? Last time, we talked about tension. Today, I'd like to talk about the value of rising intensity. If you have a tense scene, and every single scene afterwards is at the same level of intensity, you will either bore your reader or wear her out! Think of several "W's" strung together.....then tipped up at a 90 degree angle to reach the peak, or climactic moment at the high point. This represents rising stakes, rising tension, rising danger, but with moments in between where the tension isn’t so high, to give the reader a breather. About those top tips of the W's: with romantic suspense, it's much stronger if each of the big suspense turning points affect the relationship in some way--forcing your hero and heroine together, or driving them apart, or adding something that strongly affects their relationship or their emotional development. How can you write a strong scene? At the beginning of each scene--ask yourself: Whose scene is this? What does he or she WANT? It should be something that s/he really needs--something that is driving him or her. Something specific to the situation right now. Then ask yourself: What are the roadblocks keeping her from easily attaining this? Inward fears? Something physical? Someone else standing in her way? Your villain? For the end of the scene, ask yourself, what's the worst thing that can happen right now to these characters, given this situation? We want to be kind and protective of our families, but our fictional characters? Make life tough for them, and your story will be more powerful, more exciting for the reader! I've been a fan of suspense novels and movies all my life. As a child, I would watch shows on television and bite my fingernails through the commercials because something disastrous always happened just before Mr. Clean or the Maytag man came on the screen. Was the girl in hiding going to be discovered by the men who had been chasing her? Was the hero going to make it safely into the deep waters after jumping off the cliff or was he going to smash onto the rocks below? I had to know and there was no way I was going to leave my place in front of the television until I knew! When I read books I'm the same way. I love chapters that end with a cliff hanger, something that pushes me to read the next page because I HAVE to find out what happens next. It doesn't matter if it's midnight and I need to get up early in the morning. I have been known to stay up reading until 4 AM because of the book was just too good to put down and I had to check ONE MORE PAGE. I think a little of this rubbed off on me. I love writing Love Inspired Suspense books and keeping readers on the edge of their seats. After all, that's what makes a great suspense book, right? How many people watched Lord of the Rings and couldn't wait for the next movie to come out because you had to know what happened next? I did. I drove my family crazy. Well, that's a little exaggeration. We're all LOR fans here. A lot of people were a little upset that they had to wait for the Two Towers to come out and then Return of the King to see if Frodo and Sam actually made it and were able to destroy the ring. But I loved it. I had the release dates marked on the calendar. The build up to going to the movies was almost as suspenseful as seeing the movie itself. I've received lots of emails from readers who read Cradle of Secrets. I'm always warmed by their responses. One reader told me that she loved the book but needed to know what happened to Ellie and Cash. Was Serena and Cash ever going to be reunited? This one reader said she HAD to know and thought about it all day at work and during dinner, even though her husband said "Honey, it's only a book." Well, admittedly, I pulled a Lord of the Rings. I can't help it. I love cliffhangers. But I assure you, you will find out what happens to Cash, Serena and Ellie. Her Only Protector will be available August 2008. While that seems like a long way off, it really won't be that long. I'll keep you updated and as soon as I have the book cover, I'll post it here for readers. I'm currently writing the last book in the series. There's no title yet, but you'll be the first to know as soon as I have one. Some days are filled with kisses from heaven. Those times you can catch the heartbeat of God, feel the breath of His approval, sense the longing of His gentle correction. At our Catlett Christmas, I got a very vivid reminder that this dream of writing is a gift straight from His heart that He has cultivated for almost 20 years. Almost twenty years ago I was 14 and in love with books. I inhaled books at the rate of one a day, and for a long time I had the spiral bound notebook to prove it! That school year I wrote letters to a stack of Christian writers. It was part of a school "assignment" -- the beauty of homeschooling, anything can become school :-) -- the goal, to see what being an author was really like. I contacted EVERYONE I could think of at the time. Christian fiction was much smaller, so the list isn't long: Frank Peretti, June Masters Bacher, Judith Pella, Madeline L'Engle, Janette Oke, and Michael Phillips. I had absolutely no fear then. Each of these authors responded, and those letters languished in a window seat until Christmas. My mom discovered them when cleaning out a room and put them in an album for me, reminding me of the roots of this writing dream. But the absolutely COOLEST part of the gift was that my sister tracked down an author that I corresponded with multiple times: Sandy Dengler. I'm embarrassed to say that she even read some of those early teenage writings and encouraged me to keep at it. She saw a spark of something or was just an amazingly kind woman. But because of Janna's call, I now have a letter from Sandy from just a couple months ago congratulating me on the release of my first book. From that I was able to reconnect with her via email. I've sent her a copy of Canteen Dreams and hope she likes it! Through it all God reminded me that while this latest foray into the dream of writing started two and a half years ago with Colleen Coble and her incredible encouragement and guidance, He also used people years ago to tell me that this dream could come true. And now it has! Okay, I know that we all want believable characters. The writer wants to build the characters in our stories in a way that the reader will sympathize, root for and love. As readers we want to sympathize, root for and love the characters in stories ( or hate, if its the villian). But how does the writer build a believable character that will fulfill the expectation of the readers? Not all characters, no matter how well-portrayed will not resonate with every reader. But as writers we strive to accomplish this feat. When I first started out writing and attended workshops, I gathered form after form of character building. Which I never did really fill out. Now, I'm not saying that the forms weren't helpful. Reading through them made me aware of the many aspects of building a character. Yes, physical description is important. The characters traits, habits, likes and dislikes are all important. But it wasn't until I was given a book by another writer that I really thought WOW, now this is how you build believable characters. The book was Goal, Motivation, and Conflict by Deb Dixon, romance author. This past Saturday I attended an all day workshop with Deb as the speaker on GMC. I'd never heard her in person give a workshop. I must say it was one of the best I've attended in along time. Her GMC books is still available. So if you haven't ever heard of GMC, you're probably wondering what that is. Goal= there are two types, External is what each character in your story wants to obtain. The goal can change as the story progress but it is what drives the plot. OR Internal is what the character feels she/he needs in order to be happy and this drives the emotional journey. Motivation = External Motivation is the driving force behind the characters desire to obtain said goal. This can be from the characters backstory, childhood, or more recently and can stem from a catalyst event. The Internal Motivation most often will stem from the characters backstory ranging from childhood to a most recent emotional upset in the characters life. Conflict= External is the forces that try to prevent the characters from reaching their goal. Internal is a bit more complicated. The conflict will arise out of opposition to the goal. The external goal for the heroine is to testify agaisnt a murderer. The external motivation is she witnessed her bosses murder. The external conflict is the murderer is trying to kill her before she can testify. The internal motivation is she was one of six kids born to neglectful parents. Of course knowing all this must then be translated to the page and sprinkled throughout the story. An easier said than done feat. But it is doable and will enrich your characters and your story. Go get Deb's book. You won't be disappointed. Our church is trying something different, for them at least. Here in the greater Phoenix area, we're spread out. The average drive time to church is roughly 21 minutes (I'm 15, so I guess you'd call it close). They've made life groups. I've been to churches that have done this. It's actually a pretty good idea. So, my family is in life group number two. This could be a problem since in group number two there's my two-year-old son, and the next kid is a female teenager. It's not. The group leader has her daughter - who attends a different church - come along, and now my son has playmates when we do outings :) Above, see my Mikey and his friend Hannah. They're drawing in the mud. 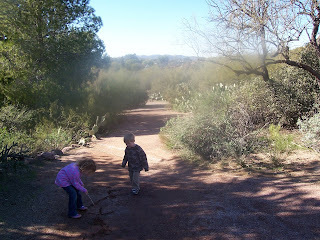 We went to the Boyce Thompson Arboretum State Park in Superior, Arizona. 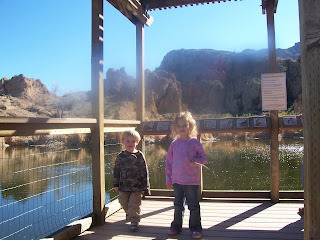 Our day was spent picnicking (drawing in the mud) and then exploring. We walked and explored and had a blast. There were waterfalls and a pond. There were paths that narrowed and paths that had drop-offs (with fences). My favorite adventure was a place called the rock house. In the middle of nowhere, this family somehow carved a home in the side of a cliff. There were three jagged rooms. And, in the early 1900's, a family of five lived and farmed there. Let's see, what else am I doing. I'm on book three of my seven Rita books. I'm almost done with the baby blanket I was making for Krista Stroever but didn't finish in time. I'm finishing up a proposal for a three book series (crossing my fingers). And, I'm thinking about trying to make homemade potato soup. TENSION....just what the doctor ordered? Tension in real-life isn't healthy. Tension in a novel, however, is what triggers readers to keep turning pages, and it adds interest and spice to any story. Not just suspense, fantasy, sci-fi, or mystery--it's good writing in general. For instance, what about a straight inspirational (or secular) romance? A good romance sparked with tension. If the tension between the hero and heroine resolves too early in the story, a reader is likely lay the book down and not pick it up again, because the story is over for her! Subplots help keep the tension (and level of interest) going all the way through. If one phase of a subplot is resolved, something else needs to take over--the main external conflict, or the relationship between the hero and heroine. Something else to keep the reader on the edge of her seat! Give the reader tension over stakes that not only matter, but that are increasing, and you've given her a story worth reading. Anything else will be too boring to hold her attention. A hint--beware the lack of white space. Count the number of pages you go without dialogue. If you go more than a couple, you should probably take a hard look at what is happening. Are you telling information instead of showing action and conflict and emotion through the on-scene interactions of your characters? Droning on and on about backstory? Long passages of narrative, unless done very skillfully, are what readers skip! This is one of the most glaring technical flaws that I see when I judge contests--and it’s the easiest to fix! How many of you have read Gone with the Wind? How many times? After a few times, did you start skipping any parts? GWTW is an amazing novel on many levels, but if you did start to skip any passages after reading it more than once, I'll lay odds that it was the long passages of narrative. The first few times, I re-read it all. An amazing book....but , then, I started reading for the wonderful characters and the emotion and conflicts. A few years back, Harlequin/Silhouette held focus group meetings with various authors at one of the national RWA conferences. They asked us to talk to readers and bookstore owners, and bring them feedback on the line we wrote for. I ended up giving them a twenty-page summary of the info I gathered on readers' preferences. One of the comments that I heard many times over: "I skip over pages that don’t have much white space. I want to read about the people! The romance! The action between characters!" So...if you are writing a manuscript, stop right now and take a look. Are you keeping the tension high? Looking forward to seeing you next week! You may wonder why I'm not naming this blog Busting Writer's Block and instead calling it Untangling Writer's Block. The reason is, when I'm having difficulty writing, it's not so much because I've hit a wall and feel blocked. It's usually because my mind has gone in a thousand different directions and I've tangled myself up. Take this week, I'm working on the third book for Steeple Hill, the reunion story of Cash and Serena Montgomery. I'm having a blast, it's suspenseful, it's romantic and I'm stuck. I'm stuck just like a thread of yarn in a skein that won't release it. On occasion this happens to me. It get frustrated and try to work through it, only to resolve myself to having to pull away from the computer and plot. I do a lot of plotting in my head in the early stages of a manuscript. I always convince myself that I can keep it nice and tidy there. Unfortunately, I'm always wrong. I hate plotting unless I already know where I'm going and it's just an easy jotting down of notes in order. This time, I have to loose ends that need to be weaved in and old characters to reintroduce and I have to make sure that suspense, the faith element and the romance are giving their due. This is what I do. I take a blank sheet of paper and fold it in half and then again so that when I open it, I have 4 equal columns. I use this for my 4 act structure. Then I start plugging in what I know about the story. I try to keep it brief because I'm only giving myself a roadmap here. I'm not writing the synopsis. I'm a puzzle writer, so I write everything out of order. (Using pencil helps. Sometimes things get put in the wrong place.) When I'm done, I can quickly see where the holes of my story are and where I have to add or rearrange scenes. For me, getting my story tangled up is always the result of me not doing my plotting chart. After 16 manuscripts, you'd think I'd learn. In the end, I fall back on my tried and true approach and get back to writing, which is where I'm going now. Nick Polchak is like Grissom from CSI: Consumed by his job, dedicated to finding the truth, and unable to let go once he’s on the trail of a murderer. This time Nick is headed to New Orleans hours ahead of Hurricane Katrina. While everyone else is focused on taking care of the living first, Nick wants to ensure no murders are covered up by the hurricane. Once he finds his first body that clearly wasn’t killed in the hurricane, he’s off to the races, with all his idiosyncrasies kicking into high gear. With this novel, I anticipated who the bad guys were from about page 100, but that didn’t keep me from flying through the novel. I couldn’t imagine how Tim would pull it altogether. Even as I began to figure it out, I was drawn in by his tight plotting and great writing style. Tim is one of those authors who pours on the description where it will help the story and backs off where it would only bog things down. His main characters are multi-dimensional and complex. If this is your first novel with Nick, you may wonder whether you’re supposed to love or hate him. If it’s your third, you’ll love the way Tim adds depth to his development. 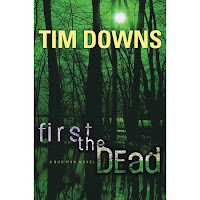 While published by a Christian publisher, this book (and others by Tim) do not contain a shoe-horned in spiritual plot. Instead, the book is all about the story – and it’s another great one. If you like tight suspense that keeps you guessing, even as you begin to figure out who did it, you’ll like this book. In Chapter Two, Maass deals with Multidimensional Characters. He asks us to count--yes, actually go through our manuscripts, highlight and then tally--the various sides of our character. He cautions that, while we may THINK our hero is complex, in reality we may not have shown that on the written page. Then Maass takes it one step farther. Identify our character's defining quality and write a paragraph that demonstrates the opposite quality. Can that be included in the manuscript? If so, that contrast reveals our character's humanity and allows the reader to identify more strongly with him/her. In my current work in progress I have a scene where the hero, a very take-charge guy, reveals a fear that has held him back. Perhaps I can compare and contrast those conflicting qualities to drive home the point and ensure the reader realizes the internal struggle that conflict has caused my character. And the heroine? Well, I need to think about her. Let's work on adding more dimension to our characters in the days ahead. I won't be here next Wednesday, but I'll be back the following week. Until then, happy writing! As I said last week, I love to do research. I do most of it via the internet but occasionally someone will recommend a book and I find that having the book in hand helps tremendously. So I want to share with you some books that I have recently discovered, borrowed or bought and have been using like crazy. I learned about some these books from a crimescene writers loop that I'm on and some from other writer friends. The second book I've recently aquired and am now starting to read through is not for the faint at heart. The title, Practical Homicide Investigation: Tactic, Procedures and Forensic Techniques: Fourth Edition by Vernon Geberth, is a no nonsense guide that is used by law enforcement agencies throughout the country. Though not written for writers, this book is easy to follow with detailed analayze for a processing a crime. But a word of caution, there are gruesome pictures and accounts of crimes that made my stomach roll. I thought I was pretty desensitized by TV and movies, but not so. Another book that I've used for a book that I recently wrote was WITSEC:Inside the Witness Protection Program by Pete Earley and Gerald Shur (the Founder of WITSEC). This book gave a glimpse into the life of the witness which for my purposes was exactly what I need. The book provided the procedural aspects of the US Marshals service that gave my book realism. Of course you can do all the research in the world and have the details spot on, but if the characters aren't believable, then nothing else matters. Next week I'll talk about building believable characters. 1) Genre list. This tool was unveiled in paper at the Mall of America signing. My sister Janna Ryan, who many of you met at the conference or know from her blog, put lots of hours into this project for us -- and she's not even a member! This list is by no means exhaustive, but it is a great place to start if you know people who are looking for new authors to try. You can also show it to bookstores...my local store has laminated the fliers from the MOA signing and posted them in the fiction section. Imagine if even 100 bookstores did that! 2) There is the author list/database that was unveiled last month. This allows you to enter an author's name and get a short sentence about what they write as well as a link to their website and shoutlife page. 3) There is a list of books divided by social issue. Periodically we'll see requests to the loop for books that deal with abortion, divorce, etc. Well, Advisory Board member Deborah Raney has kindly allowed us to post her list that has been developed over time. I'm cleaning and redecorating my office. It needed cleaning. I've got things piled so that I can barely traverse the path to my desk. It bothers me because I'm basically an organized person. Unfortunately, I'm also a busy person. The first thing I'm doing is getting rid of the futon. It's big and the cat has claimed it as her own for the last two years. This means no one else sits on this BIG futon because the LITTLE cat sheds like crazy. Right now, all that's left of the futon is the frame, which my husband needs to help me move. I cleared a path to the door :) This means I went through all the VHS movies I had in shelves by the door. My goal was to toss all but 21. I tossed all but 25. I'm to the point where I'd rather pay the 5$ to rent rather than store dusty movies. Gone are the Spidermans, the Lord of the Rings, the Men in Black. Staying are Sleepless in Seattle, Clueless, The Last of the Mohiccans. After I do the book reduction, I'm opening the closet that is currently blocked by the stacks of books. I sorta know what's inside. Welcome, from Sunday's Craft Lady! Just in case you might have skimmed over it, page down to Debby's post on Donald Maass. I absolutely love his book. I marked up my first copy so much that I finally had to buy a second one! So make sure you come back and see what Debby has to say about his wonderful techniques, in the coming weeks. I sure will be--it's always great to have a chance to learn more! Last time, I suggested trying to coming up with five or six progressively more dramatic events leading to the big, climactic action you expect to have at the end of your story. It's a great way to start laying out your book. And, I mentioned that this works whether this is a suspense or a straight romance, or even a light-hearted romp, because "worsening events" can be anything from humorous/embarrassing situations, to a killer on the prowl. Once you have a framework, you can expand it--by adding a logical sequence of main and subplot events along the way. Having strong, interesting subplots help with "bridging tension" (that's a Maass term!) so there's always something uncertain or tense or new going on, even if your main characters are off-scene. Make sure you keep a good balance amongst your main plot and subplots, though. Secondary characters can be a lot more quirky and fun to write, but don't let them take over the story! Until next week...wishing you great success with your writing! Today I was reminded why I both love and hate change. I received a call from my editor at Steeple Hill telling me she is leaving. My first thought was "No! You can't leave me!" After my heart returned to a regular rhythm, she assured me that I would be well taken care of by my new editor, but the thought of letting go was just too scary. I thought about it a second and began to think it was fairly selfish on my part to expect her to stay at Steeple Hill just for me(after all, I'm not her only author and I'm sure everyone was saddened to see her go) so I wished her luck and hoped to stay in touch. It reminded me about how much I have a love/hate relationship with change. While change can be exciting, new directions, new ways of looking at something, there is definitely something comfortable about the familiar. If I hadn't just come off a marathon week of revisions on my next book, Her Only Protector, I'm not sure I would feel quite as strong about not wanting change. When I'm writing, my characters become so real to me that the thought of changing them in any way feels like I'm violating some deep part of them. Cutting out scenes, changing motivation, rewriting scenes I'd come to love is sometimes painful. In the end, I've trusted my editor to show me the way, let me see things from a different perspective and learn something new about my story and my characters. That change is good. It doesn't always feel good when it's happening, but it ends up good for the story. So while I sit here sad that the editor who saw me through my first Steeple Hill book and part of my second is leaving me, I am exciting about the changes she has coming up in her life and about developing a new relationship with my new editor. Jessica, if you are reading this, I will miss you, but I wish you all the best. Elizabeth, I can't wait to meet you and work on many manuscripts for Steeple Hill with you. I Saw Deadly Exposure at cbd.com!!! Yeah! This weekend I was exploring the web in the middle of writing and discovered Deadly Exposure is up on cbd.com. I almost cried when I saw it there. This is the very first book I wrote when God finally whispered in my heart that it was time to start writing. Folks who read the early versions could tell you how, umm, interesting the first, second, and third iterations were. I had a lot to learn, but God put wonderful people in my path to teach me. My editor at Steeple Hill could tell you how much work we had to do on it once she agreed to buy it. Though it was a ton of work, I am thrilled with the final result. I've wanted to write suspense for years. Think Mary Higgins Clark flavor. And this book is close and one hope you'll enjoy. Keep your eyes open. It releases in May. When a murder took place in the theater box next to TV news reporter Dani Richards, she was completely shocked. She hadn't heard or seen a thing. And when her coverage of the story led the killer to stalk her, police officer Caleb Jamison-Dani's ex-flame-insisted on protecting her. Should she let him close again.or risk her life with a killer? Santa left a copy of WRITING THE BREAKOUT NOVEL WORKBOOK, by Donald Maass, under the tree for me this year! I first met DM when my Georgia Romance Writers Chapter invited him to do a one-day workshop for our group a few years ago. It was great day, full of lots of hands on writing exercises that I could incorporate into my work in progress. Of course, I bought his book and was convinced my craft would instantly improve. Over the years, the text has gathered dust, and I've long forgotten most of the tips he shared either at the workshop and in his book. A dear friend Sharon Yanish, who has since moved to the good life in sunny Florida, invited DM to do a workshop for her local Southwest Florida chapter, scheduled for January 26th. Sharon's a big fan of Maass' technique, and she insisted his workbook was better than the book. So this year I dropped a few hints to hubby, AKA Santa, that the workbook would be a nice Christmas surprise. Thus the reason I made a resolution on January 2nd to incorporate some of DM's tips and techniques into my 2008 writing. Long story to get to the point. I'll be blogging about what I've read and what I've learned over the next few weeks. If you're a Maass junkie or just interested in what I've picked up from his exercises, tune in on Wednesdays. His first lesson focuses on heroes! He suggests writing down the names of our own personal heroes and then determining what characteristics or qualities make that person stand out. Of course, that got me thinking. My hero? Well, hubby, naturally. But also my son. He's a Captain in the US Army, slotted to be promoted to Major in February. He attended North Georgia College and State University, a four-year military college, and was commissioned in the Army upon graduation. Just a year later, he was on his way to Kosovo to help the folks in that war-torn country. Later, he had a three-year tour in Germany where he fell in love with the country and its people. After a short time home for Ranger School, Jump School (He was the top graduate in his class.) and Airborne School, he was deployed to Iraq with the 101st Airborne. A little over a year after he returned home, he was heading back to Iraq for a second tour. Despite separation from friends and family, he never complains. I know his "can do" attitude is not unique in the military. Most of our wonderful guys and gals in uniform have the same optimism and sense of duty, honor, country that defines my son. But he's closest to my heart and, therefore, my biggest hero. Next, DM notes the importance of having our protagonist act heroically in the first scene. Then we need to include at least six more situations where he/she can demonstrate those qualities as the story progresses toward the climax. Okay, I'm off to review the book I'm working on now to ensure my main character is heroic. Thanks, DM, for some great tips! Research is a part of the writing process that I love. With the help of the internet, I can look up just about anything. I can find descriptions of places I've never been, find facts that will make my writing that much more interesting and scare myself with some of the information I learn. Recently, I was researching Obessive Complusive Disorder for a book I'm writing. It was fascinating and also a bit nerve wrecking to learn there are various causes besides hereditary. One cause that I found interesting was that an extremely bad case of Strep Throat can trigger OCD. I've always heard you don't mess around with Strep, if you even suspect you or your child has it, take them to the doctor. I know that the infection, if not treated, can moved upward into the brain, but I didn't realize the other danger. And of course from the OCD sites, I lost precious writing time by clicking on several other links to other fascinating disorders and totally became engrossed. I know way more than I ever wanted to know about things I hope never to have to come face to face with in my life. But what is that saying, forewarned is forearmed. Research, fun and fascinating but time consuming. I am a morning writer. No, I am not a morning person. Before marriage, and especially before baby, my perfect day started at ten and ended at 2 a.m. I usually wrote in the evenings or midnights. Now, I write in the mornings before sunset. I think before husband, I'd only seen maybe three sunsets. This is where the cat comes in. I have a cat named Pricilla. She's from my single days and actually has seniority over husband and kid, which she does not hesitate to use: my chair, my spot on the bed. Her job is to make sure I get up around 6ish and write. If I don't, she cries and cries and cries. If she were younger, I'd be tossing her outside. But in human years, she's over 20. I don't know, she was grown when I got her, and I've had her 18 years. In kitty years, she's at least 140. So, I don't toss. Getting me out of bed to write is her only constructive contribution to my writing. She does contribute in other less constructive ways. For example, she leaves cat hair on my desk (sometimes ickier things). Often, while I in deep writing mode, she'll sit on hand or walk across my keyboard. I just know occasionally, my editor finds this in the middle of a sentence. They ran across the room, two souls, meeting as o6hibne. I can only hope my editor has a cat! As your Sunday CRAFTIE lady, I've been talking about pre-planning a book. Brainstorming ideas. Characterization. Subplots. Conflict. Pulling it all together, in a sketchy way, can be tricky! Especially since everything can start to change, once you start working on the story. In one of my earlier books, Operation: Katie, I had no idea, during the planning stages, that my villain would set a fire that would then lead into the climax. Yet--suddenly, it happened. And it worked. There's no sense in being locked into a rigid plan devised before you begin writing your story. And sometimes, especially after the first half of the story, the characters may do and say things that surprise even you, because it comes out of who they are, and because you've done a good job of creating them! How can that be? Once you create your characters, giving them flaws and strengths and back stories and personalities that are real, they essentially take on a life of their own. It's a strange concept to readers, I imagine, but if the author then tries to make these characters blithely say and do things in opposition to who those characters are (just because its convenient to the author for this to happen) it will ring false. Jarring the readers' expectations in this way is going to pull them out of the story. Yes--your characters can make mistakes. They can be forced by circumstances to do something they don't want to do (great inner conflict!) Your heroine can dissemble, or do something recklessly...even lie, if the reader sees strong motivation behind it. But dropping in language or actions that are totally out of character, and for no good reason, will make her far less real. How many books have you tossed aside after becoming irritated with the main characters for being "too dumb to live" or for coming across like cardboard? Back to planning out a story....how much do you plan ahead? Do you sit down and just write (seat-of-the-pants), or are you a plotter, who plans everything carefully first? Something in-between? I try to work out a very simple "Plot Spine" that shows me where I think I will end up....and try to list the key, progressive turning points between the beginning and the end. As I mentioned above, things may totally change. But...it can help me see where I'm headed! A simple road map means less chance for time-consuming detours and false turns. I know. Every year people talk about New Year's resolution and how they're going to be good about doing something. I don't call them resolutions. I call them goals. Resolutions are things you want to change. Goals are things you want to achieve. I like the sound of that better. 1. Take a little time for myself. I've been blessed this year to have a lot of success with my writing and my freelance copywriting business. Unfortunately, it's taken me away from doing some of the things I enjoy. 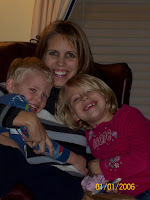 Being the mom to 4 teenagers means I already have a lot on my plate, so it's easy to forget there is a "me" in my list of things to do. So my goal is to take 1 hour per day just for myself to do what I want. Whether that is to read a book, watch a movie with the kids or plant in my garden (when spring comes) doesn't matter. 2. Finish writing the third book in my series following Cradle of Secrets and Her Only Protector. So far, I'm finding Cash Montgomery to be the most romantic of the bunch. I'm a major sap for reunion stories too! 3. Draft the proposal for a new series for Steeple Hill Love Inspired Suspense. I'd like to have the idea for at least 3 more books and have the proposals written for at least 2 of them. 4.) Number 4 is more of a hope than a goal since anything beyond the writing is out of my control. I'm hoping that Steeple Hill decides to publish Fly Away Home, a proposal I've submitted to them already. Wish me luck. While I love writing suspense, I do enjoy writing straight contempory stories as well. This is one of the reason why I was so excited when I sold to Steeple Hill. They publish contempory romance, romantic suspense, women's fiction and historical romances. How can you not find a wonderful inspirational book to read with so much to offer? 5. Personal goal: Write down all the stories my mother in law has told me over the twenty years I've known my husband's family. See, my mother in law and father in law grew up in World War II Germany. Their extraordinary stories of love, friendship, faith, struggle, survival and heartache about what they lived through propelled them to come to America. These stories are my husband and children's family history, something I'd like to preserve for them. I've often thought of trying to write down these stories and put them into a historical romance set in WWII. Who knows, maybe I will some day. For now, I want to make sure these stories are not lost and that my children understand what their Oma and Opa went through to bring them to freedom. That's all for now. I have a lot of work ahead of me. But I don't mind. I'm one of the lucky ones to have been blessed with being able to do what I love doing. Writing wonderful stories that I can share with others. Over Christmas, it was great to be home again in North Platte, Nebraska. We put almost 2,000 miles on the car between December 22nd and this morning when the wheels hit the driveway. 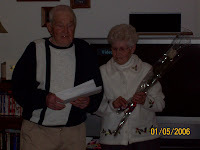 I loved every moment with family, but it was incredibly sweet to watch Grandpa (Willard from Canteen Dreams) give Grandma (Audrey from Canteen Dreams) her first roses from him -- 61 years into their marriage! I guess he didn't give her flowers on her birthday like the Willard in the book did! I also had the amazing honor of meeting Mrs. Ethel Butolph, one of the ladies who met her husband through the popcorn balls that were distributed at the North Platte Canteen during World War Two. She saw my interview during the 11:30 news show on KNOP (click the link to read about the book-signing) and came to my book-signing. While it had been a blast being back at KNOP -- where I worked for two years in college -- Mr. Carlini was there and regaled Eric and me with just a couple of his World War Two stories. I have a sneaking suspicion more than one will find it's way into the future World War Two books I hope to write. But it was absolutely incredible to meet Mrs. Butolph! Then she invited me to her house to listen to some songs written by Ms. BJ Bjorkman about the North Platte Canteen and her popcorn ball. Such fun! Walking through her home, sitting down chatting with her, it was incredible! I guess you'd have to be a history buff to understand how huge this is! One of my regrets is that I didn't get the green light or idea from God five or ten years earlier to write these World War Two stories. Then I could have attended veterans reunions and met more of the people who lived the experiences I try to bring to life in my books. Yet with each book God has allowed me to connect with at least one person who did live it. With Canteen Dreams it was a long phone conversation with a veteran who passed through the North Platte Canteen five times during the war and still vividly remembered each 20-40 minute stop. With Sandhill Dreams, it was spending a day with Thomas Bueckner, who while he didn't live the war, he'd invested years of his life talking to the men who did and knew their stories like his own. And now, while I race to deadline for Captive Dreams, I meet Mrs. Butolph. While her story has nothing to do with Captive Dreams, it reignites that fire of passion that I'll need to make Captive Dreams the absolute best book that I can before I turn it in on January 15th. So if you think of it, pray that I'll have a burst of creativity, passion, and endurance to finish this race well -- and it will be a race. But it's one I want to run in a way that honors God fully. We're into the New Year! It's 2008! A new year filled with new beginnings. A recent article published in the Atlanta Journal-Constitution claimed fewer and fewer folks set New Year's resolutions, and of those, only about 8% achieve their goals. According to the AJC piece, our New Year's resolutions should be specific, set within a certain time frame, and while challenging, they should also be attainable. Internal motivation is the key to commitment. Writing goals or resolutions down and reviewing them often within the set time limit helps ensure we remain focused and on track. So what are your goals for 2008? To write a set number of words each day? To finish a book? To send in a proposal or query or finished manuscript? My writing goals include, finishing the first book in my Magnolia Medical series by my February deadline, completing the second book in the series a few months later, brainstorming book three and submitting the completed manuscript to my editor by the end of the year. My hubby gave me Donald Maass' WRITING THE BREAKOUT NOVEL WORKBOOK for Christmas, so another goal is to incorporate some of his techniques into my writing. Personal goals? Exercise and watch what I eat, of course! But also, increase my daily time for prayer. Be open to the Lord's will for my life. Respond to the needs of those around me. A number of years ago, I made a commitment to pray for my readers each day, and that includes you. Hope you can feel the prayers! Good luck setting your goals for 2008! Wishing you abundant blessings in the New Year! Every new's year day I start off with a list of goals for the new year. Then the list gets buried beneath the piles of papers and stuff in my office and forgotten. Sometimes never to be seen again. I wonder why I write the goals down anyway? I believe in the power of the written word. If I commit something to paper, I believe it is also imprinted in my mind. So even though my list may never be looked at again I have the memory and subconsciously am working toward my goals. I write short term goals, ones easily obtained within a reasonable amount of time. I write medium goals that may take longer and require more of my time and energy. And I also write long term goals that may not see fruition within the year, but that I continue to work toward and they may be continued from year to year. I'll share a few of my short and medium goals with you. Long term goals are best kept to one's self. Take a moment and think about your goals for the year 2008. Write them down somewhere and remember, even if you never look at them again, you will subconsciously be working toward them. May the Lord bless you this year.